This calendar quarter brings 19 investors, 11 investments in 8 funds, and 11 mainstream investors jumping into investing in impact businesses. 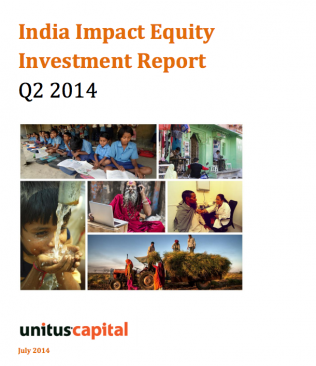 Unitus Capital has issued their 2014 second calendar quarter (Q2) impact equity research report. They noted that impact equity investing continued to be a key component of the India private equity landscape making up 31% of the overall private equity transactions in India. Unitus Ventures (formerly Unitus Seed Fund) was again mentioned to be the most active impact seed-stage investor in India with 4 impact investments in this quarter alone. BFSI sector got back on the top with 5 transactions in Q2 2014 equaling their record in Q2 2013. The financial services sector picked up with 4 deals in Q2 2014 from 1 deal in Q2 2013, and was still among the leaders. Strong growth in IT & ITES sector with 3 deals in Q2 2014 compared to none in Q2 2013. Some recent exits like Aavishkar’s first fund getting a full exit from Milk Mantra, have attracted an even greater investment interest in the impact investing sector from non impact investors. Since Unitus Capital’s founding in 2008, they have raised US$1.1 billion for 52 high-quality impact businesses in India, Indonesia, the Philippines, China and Australia. The capital they have raised for their clients has enabled them to positively impact an estimated 39 million lives.